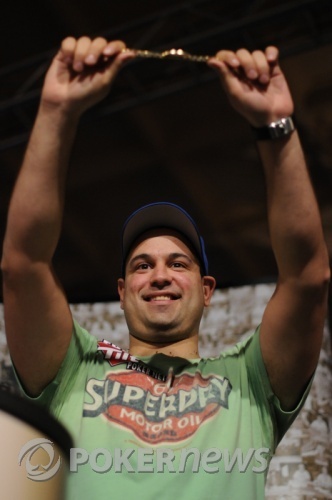 Becoming only the second player to ever complete the so-called 'Triple Crown' (WPT, EPT and WSOP titles) Roland de Wolfe also became the second bracelet winner for the UK of this series. Afterwards Roland admitted that he had probably played less than an hours PLO8 in his life, "I had played Pot-Limit Omaha and Limit 08 so I just tried to mix the two together!" De Wolfe said he learnt a lot from watching Clements and Richey on the final, he felt he was the least experienced three-handed and had to gamble more because he wouldn't be able to chip away at the other two. On winning the WSOP bracelet to go with his WPT and EPT wins, Roland called it, "The missing link," claiming he was much more nervous than either of his other big title wins. Finally, he said he would definitely be back tomorrow to start playing again! Congratulations to Roland de Wolfe, winner of Event #27! After a raise and a call preflop, the flop came down between Roland de Wolfe and Brett Richey. De Wolfe checked and Richey fired a bet of what looked like 140,000. De Wolfe announced that he was all in, which really meant that he was betting the pot. Richey then went all in and Roland made the call. It would be Roland's two pair up against Brett's top pair and wrap draw. The two stood from the table and watched the dealer as the crowd swarmed the table. The turn was the and then the river was the . Richey failed to catch up and was eliminated in the second place. Roland de Wolfe won the hand and collected all of the chips. Richey took home over $150,000 for second place and his largest tournament score yet. 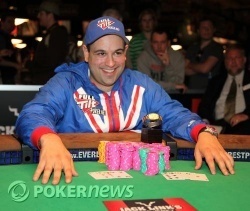 De Wolfe won nearly $250,000 for first place and the coveted WSOP gold bracelet... his first! On an board, de Wolfe check-calls a bet of 36,000 from Richey. Both players check the turn before de Wolfe comes out betting the pot on the river. Richey makes the fold, leaving himself with 520,000. Interesting to note that Richey is not betting full pot most of the time and trying to control the size of the pot. 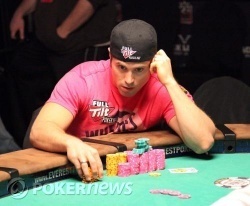 De Wolfe only seems to pot, perhaps attempting to make his opponent play for his stack with every decision. All-in on the turn of a board, Roland de Wolfe check-raised the pot after a 120,000 bet from Richey. Richey responded by moving all-in and de Wolfe called. Richey was freerolling the flush but missed on the river. Chop it back up guys. Brett Richey won the first pot of the HU, potting on the river of a board after de Wolfe had raised. He's still down about 4:1 in chips though. Scott Clements potted preflop and Roland de Wolfe called. The flop was and Clements potted again. De Wolfe reraised pot and Clements went all-in with the Brit calling. The turn secured the low for de Wolfe barring a four. The river was the which gave de Wolfe the high also. 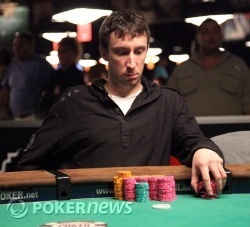 After a countdown, Clements was eliminated in a pot worth about 2,500,000 of the chips in play. Scott Clements raises preflop to 80,000 and Roland de Wolfe reraises the pot. Scott Clements now re-pots it and de Wolfe calls all-in. De Wolfe shows , but is in trouble against Clements' . The board runs out , making de Wolfe the nut flush. Commence the chopping of pots!